In the middle of November the USDCHF fell reasonably sharply from an 18 month high above 1.01 down through the key 1 level and to a low around 0.9860 before dropping further to the three month low below 0.97 last month. Throughout September and October the USDCHF moved very strongly from a six months low below 0.9550 up to the highest level in 18 months just above 1.01. After the high it spent a couple of weeks consolidating above the parity level enjoying some reasonable support from the 1 level. Parity remains a key level and is likely to continue to influence price action, given how much it has remained within touch of this level over the last year. For an extended period through June, July and August the USDCHF traded in a narrow range just below parity as it met stiff resistance from that level. 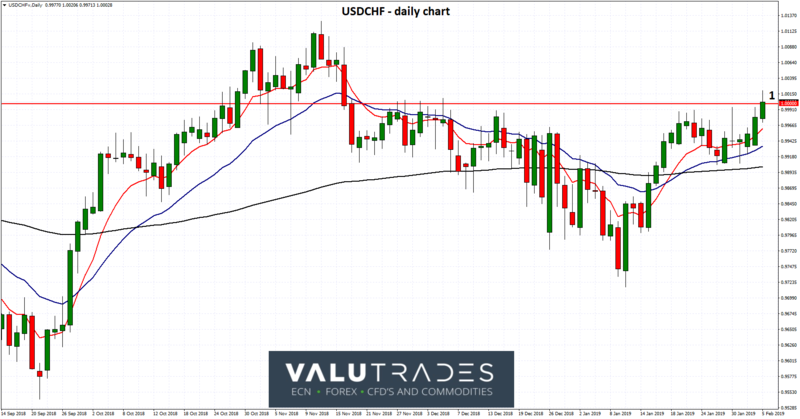 The USDCHF did push through 1 for a short period reaching a then 12-month high above 1.0050 around mid-July. Prior to the multi-month consolidation in the middle of the year, the USDCHF had moved very strongly from multi-year lows below 0.92 in February up to around parity in early May. Should the USDCHF decline from its present levels, the next potential key level will be 0.9450 as this played a role earlier this year, providing resistance on several occasions, and may now provide some support. Swiss National Bank (SNB) Chairman Thomas Jordan has suggested that a disorderly British exit from the European Union (EU) could hurt Switzerland. Mr Jordan believes that if Britain leaves the EU without a deal, it could have a widespread negative impact on the European economy as well as global markets. “It is most likely a no deal will have rather a negative impact on the business cycle in Europe,” Jordan said in the interview at the World Economic Forum annual meeting in Davos. “It will change sentiment and change decisions. At least in the short run it will have a negative impact and probably also in the long run depending on what happens after that.” He also believes that the SNB’s current expansive monetary policy is “appropriate” given the ongoing uncertainty in global markets. He added that there he saw “really no need” to change course. A disorderly Brexit would have a negative impact on the Euro and pound, and by extension Switzerland as they export to those countries and the exchange rate is important. “At the same time we still have a fragile situation on the foreign exchange markets and an increased uncertainty in the global economy,” Jordan said. “As long as these circumstances [are present], there is really no need to change our monetary policy,” he added.